"It's definitely in the double digits," one source told the Free Beacon. While U.S. officials have publicly claimed the symptoms—which include severe hearing loss—began around December 2016, multiple sources told the Free Beacon some reported illness earlier. This raises new questions about the Obama administration's handling of the incidents and whether they informed the required members of Congress about it in a timely manner, the sources said. Many key lawmakers are concerned that the Obama administration delayed notifying Congress and may have downplayed the impact of the incidents in order to try to protect President Obama's détente with Cuba. The executive branch and the intelligence community are required to inform the so-called Gang of Eight—the top Republican and Democratic leaders in the House and Senate and the top Republicans and Democrats on the House and Senate Intelligence Committees—about developments with serious foreign policy or covert ramifications. It's unclear why the Trump administration waited until August to publicly acknowledge the illnesses. Key members of Congress were notified earlier this year, the State Department has said. President Trump and his team spent the first half of the year evaluating Obama's Cuba policy, and Trump announced revisions to it in mid-June that mostly included tighter travel restrictions, especially to hotels owned by the Cuban military. In May, Trump kicked two Cuban diplomats out of Washington over the incidents. Key members of Congress and other critics want to know why the two diplomats Trump sent back to Cuba were junior members of the embassy team. "If you wanted to send a real message you would ding the most senior members of their staff," a source said. Lawmakers also want answers to whether the Obama and Trump administrations accurately conveyed the incidents and the risk they posed to U.S. workers assigned to replace sick colleagues as part of their preparation for work in Havana and why the U.S. government never issued a travel warning to the U.S. public in response to the incidents. One veteran foreign policy adviser who is close to the White House told the Free Beacon that the operation against the United States could have been run by any number of rogue actors operating in Cuba, though it is likely the Cuban government would be aware of such covert action. "There's no reason this has to be the Cubans," the source said. "That place is a playground for some of the worst actors on the planet: Russia, Iran, Venezuela, and so on. U.S. adversaries and enemies have free rein there, which is one of the many reasons it was better to try to isolate Cuba than pretend they could be productively integrated into the international community." The Canadian government last week acknowledged that at least one of its diplomats also suffered from similar symptoms and experienced hearing loss, leading to speculation that Russia, instead of Cuba, was responsible for the sonic damage. Cuba doesn't have an adversarial relationship with Canada but tensions are rising between Ottawa and Moscow over recent Canadian sanctions. Cuba experts say the Castro government keeps such a close watch on foreigners on the island that it's highly unlikely that Russians could act without the knowledge and even consent of the Cuban government. The State Department so far has released only limited information about the incidents, with officials saying their investigation into exactly what took place and why is still ongoing. Last week, Secretary of State Rex Tillerson described the incidents as "health attacks." "We've not been able to determine who's to blame," he said. State Department spokeswoman Heather Nauert last week said the United States is still assessing the situation and "can't blame any one country." "We have spoken extensively with the Cubans, as you know. The reason we had [the diplomats] leave is we said this is the agreement that the U.S. has with the Cuban government. They are responsible for the safety and security of our [diplomats]. They are not safe, they are not secure because something happened to them." 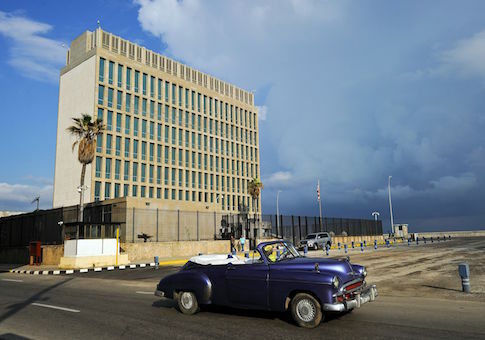 She said the U.S. embassy in Havana, however, is "fully operational, fully staffed" but would not elaborate if all the posts have been filled for those diplomats who left in the wake of the incidents. This entry was posted in National Security and tagged Cuba, Obama Administration, Trump Administration. Bookmark the permalink.